Nicolas Provost, Plot Point, 2007, still from a color video, 15 minutes. 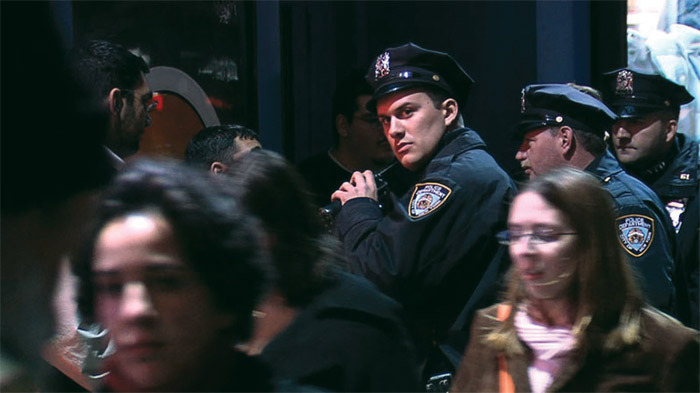 It is hard to believe that Nicolas Provost filmed the entirety of Plot Point, 2007, with a concealed camera on the streets of New York. The production value of the images and styling seems more like what you would see in a vintage Lynch film, and with a similar sense of artifice. Ordinary life is transformed into pure cinematography, as if you were watching a Philip-Lorca diCorcia photo come to life. The light feels like stage light. The people on the street move like dramatic performers. There is a suggestion of an intangible tension in the streets, and we feel that something is about to happen. Policemen on their walkie-talkies seem to be nervous about something. Suddenly, one of them appears to notice the artist’s camera. For less than a second he looks into the lens. Then he continues on doing what he was doingacting important. And what about that sharply dressed bodyguard?